Visibility/Location: When making reservations by phone, you are instructed to meet at the war monument in Central Park. 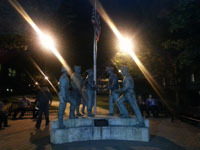 The monument is very visible from Washington Street�well lighted, and there was a good sized crowd, along with the host and his assistants to greet you upon arrival. To keep the tour on schedule, they do suggest arriving 20 minutes prior. Parking in Naperville on Friday night can be a bit of a challenge. With an area known for it�s heavy nightlife � and some great weather! � the area was PACKED! But we still managed to find a good spot in the parking garage about a � block down. There is also an open lot and street parking for overflow, but the garage is possibly your best bet. Although there were no visible signs from the street, the monument made the location extremely simple to find � which we did without difficulty. 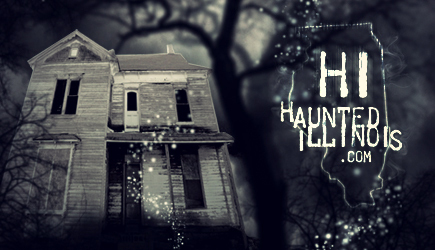 Wait Entertainment: Being a tour instead of an actual haunt, this category did not apply. There were no tricks to be had prior to the tour�s start. Just a simple sign in, square up payment and chat with the other patrons who were excited to embark on the tour. The tour is advertised at 90 minutes. Unlike some of the tours, events where I have visited, the hosts did not constantly check their watches, rushing you out. Going with the flow of questions and the tour itself�this event was exactly 2 hours in length. Scare Factor: Aside from the very interesting topics, I would say that the chance for scares was Low-Medium. Which could vary depending on how active of an imagination you have! As recommended, it is suitable for children 16 and over. Although, I do believe my son would have enjoyed the tour � he is 15. Crowd Control: There was a good sized group of 30 along with us for the tour last night. Which I found to be perfect. There are no mics, and Kevin�s voice, although entertaining!, can be a little difficult to focus on at times when there is background noise. These are public areas that you will be visiting, and the school in particular had a lot going on. They do mention that they do the tour for much larger crowds quite frequently � as many as 90! � but, I feel that it would take away from the intimacy of the tour and I would not have enjoyed it as much, walking away disappointed. The crowd of 30 was perfect. During the walking portion, there was no waiting for everyone to keep up, the tour flowed smoothly and we were able to focus on Kevin and his assistant as they told their tales. Smaller is always better! Now, is Naperville haunted? It�s something you will decide for yourself. Kevin Frantz spins some great tales that mixes well known fact with the unknown darker side, which will pull you into the tales spun. Naperville, with it�s great history and beautiful historic sites is a perfect setting for the tour. This is a walking tour, spanning about a good � mile�but there is no heavy walking involved. Although I do recommend wearing some comfortable shoes! There is a lot of standing involved. The tour winds around several blocks, stopping, very often, at various sites. We were taken to 5 different areas before the tours completion. Kevin is an extremely animated host and it is fun simply watching his stories progress. His assistant completes these tales with pictures, documents and EVP recordings that they�ve pulled from the sites during their investigations. Now, to be honest, I found some of the stories just a little far fetched! But, that�s just me. Constantly on my toes, it takes quite a bit to get me scared! And I am very much the skeptic. But, I still enjoy a great time! With this being said, I found the tour very entertaining and not as cheesy as many of the tours I�ve been on previously. The crowd itself was a great mix and fun. Skeptics, curiosity seekers, and even some scardy cats! Everyone was kept very entertained and had a great time, asking thoughtful and informative questions when possible and being thoroughly involved in the stories. Before you embark on the tour, as an added touch, they do inform you of a nice app that you can download to your phone that will enable you to pick up any energies along the tour route. Adding more to the fun factor. There are two options for this app�a free and paid version�there was no preference by the hosts on either. We did download the app after another couple told us they had picked up some energy on a stop�but found that it gave different information between phones � found it a very cute novelty, but not necessarily spot on accurate. They do encourage plenty of picture taking along the route. Sharing that many of their customers have picked up orbs or in some cases full body apparitions along the way. One of the couples with us last night picked up an orb on a shot of the St Peter Paul church � which was very cool and surprising. Very much liked that indeed. After hearing the tales and seeing the orb shot with my own eyes, I will admit, I came home and did some investigative work on my end. Had to! There were some great stories � one about Adolph Coors in particular � that grabbed my interest. Did not find some of darker facts that Kevin had spoken about, but his history portion was very spot on. Which, was enough to keep things interesting enough and add to my enjoyment of the tour. I do recommend this tour if for nothing else but the factual history behind the tales. The stories spun are super fun, and can be believable � depending on how over active your imagination can be! And Kevin is a fantastically fun host! I do believe Naperville does has some great history behind it and some great tales to tell. It is a very old town, if not one of the oldest in Chicago�s surrounding area. The backdrop of Naperville is always wonderful and the weather this year has so far been great! For the cost of the tour and the time spent on it, found it a great way to round off a nice Fall evening and setting the mood for a fun season.